A nice shrimp recipe with a sauce made by cooking the shrimp heads in white wine and cream. Beautiful and delicious, especially if garnished with salmon roe. Peel and de-vein shrimp. Keep heads and shells. Melt butter in a heavy pot over medium heat. Add shrimp heads and shells. Cook for a few minutes until fragrant, adjust heat so things don't burn. Add garlic, cook for 2-3 minutes. Add dry white wine and water and bring to a simmer. Simmer gently for about 15 minutes. Slowly stir in heavy cream, simmer for another 10 minutes. Strain through a fine sieve, press down on shrimp heads to extract as much of liquid and flavor as possible. Discard heads. Bring the liquid to a simmer again, add saffron, and cayenne cook gently for another 2-3 minutes. Adjust seasoning with salt. Remove from heat, slowly stir in cornstarch slurry, heat up again until the sauce thickens. Place shrimp in sauce, heat up for a few minutes until fully cooked. 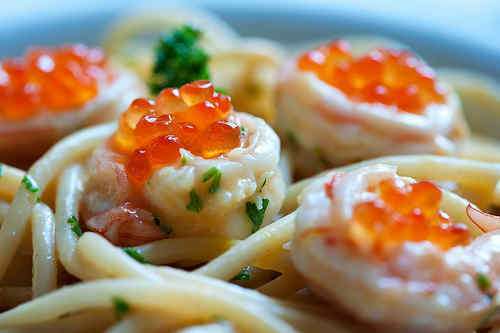 Serve over pasta, garnish with parsley and salmon roe (optional).